Monteverde Fountain 9 in 1 Tool Pen - Monteverde Pens. Manufacturers of fine writing instruments, gifts and promotional products. The Monteverde Stylus Fountain Tool Pen Is A Gadgety Novelty Pen With A Lot Of Neat Features. In a fast paced world, having the right tools at hand is crucial, and the the Monteverde Stylus Fountain Tool Pen brings nine tools in one premium quality writing instrument! Truly a handyman’s dream, fitted out with plenty of tools to help you get some very important business done – hence its name, the Tool Pen. First, you can jot down notes with the iridium-pointed fountain nib (just you can still be sophisticated while doing some handiwork) or, if you’re more of a technology geek, you can use the soft stylus end to tap out your notes on your iPad or tablet computer instead. The heavy weight, 6-sided barrel houses our smooth writing Fountain Pen at one end an ultra sensitive touch screen stylus at the other. Under the stylus top are phillips and flathead screwdrivers, whole on the barrel are a built-in level, ruler and 3 different scale functions. The chiseled spring clip will hold the Tool Pen™ securely in your pocket, ready to handle more jobs than any other pen! For those who love traditional writing along with their gadgets, the Tool Pen™ Fountain Pen is the one to have! Featured the same 9 functions as the ballpoint, smooth and reliable steel fountain pen nib.. The Monteverde Stylus Fountain Tool Pen is a pretty unique fountain pen which Monteverde has come up with. It integrates multiple tools into one product. First off we have the bubble level on the pen which allows you to see if your surface is level or not. It also comes with a multi-scale ruler on the pen. On the pen we have a four inch ruler. We also have three different metric scales around the pen. It has a chrome clip here on the pen. On the other end of the pen is the fountain pen. It has a cap that unscrews from the pen. The nib of the fountain pen version appears to be a Schmidt nib found in the Karas Kustoms Ink and the Retro 51 Tornado fountain pens. It doesn't say "Schmidt" like the others do, but the scroll work and wording are very similar. It doesn't have a nib size marker on it, but lays down a wet line and only comes in a medium. The nib isn't too bad and the flow is excellent. Standard size fountain pen ink cartridges to replace the fountain pen ink cartridge and remove one of the top section of the pen away from the barrel and you can insert a cartridge into the fountain pen. 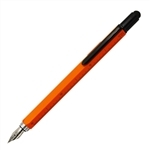 To insert back into the pen you align the arrow to the clip on the pen and simply press that back into the barrel of the pen. 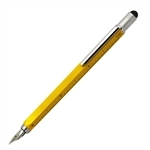 Sorry, a converter is not possible with this pen as there is not enough room because it is quite compact. A great gift idea! This high quality, heavy weight multi-function Monteverde Stylus Fountain Tool gadget pen comes with 9 different handy functions and is available in Black, silver, dark blue, bright yellow, orange and red, a wonderful gift for builders and contractors or guys who love a bit of DIY. Monteverde Stylus Fountain Tool Pen is one of the best gadget gifts for men available in the stationery world today. The Monteverde Stylus Fountain Tool Pen is the Swiss Army Knife of pen, bringing together a number of useful tools to serve all of your writing, office and daily needs too!